Waterproof cargo bags give extra storage space you need on a road trip. In fact, cargo bags are one of the best options for freeing up space inside your vehicle. There are many different things to look for when shopping for a cargo bag. But you’ll agree with me that waterproofing quality of a cargo bag is one of the most sought-after. This is to ensure that your items are kept safe from the elements. When choosing the right waterproof cargo bag, you need to pay close attention to the shape, size, and style of the bag. This will help you get a cargo bag that’s designed for a specific purpose. What’s more, these cargo bags have different waterproof ratings. This means that there are those that perform best than others. Having said that, let’s look at a list of the best waterproof cargo bags you might want to consider for your next trip. This rooftop cargo bag is ideal for those that are on the go. The bag gives 15 cubic feet of storage space. It’s made of a waterproof fabric that’s resistant to dirt and weather elements. Flexible soft sides ensure that the bag fits odd-shaped loads. Sliding buckle closure system makes the bag easier to attach with minimal effort. This waterproof cargo bag folds to a compact size for space-friendly storage. All roof racks with attachment capabilities provide great compatibility with this cargo bag. The sealed seams and premium quality material used to make this cargo bag give a storage solution that’s virtually weatherproof. 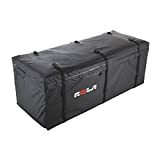 This is a large rectangular cargo bag with an expandable storage. 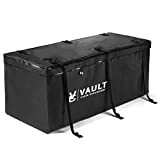 It has a storage volume adjustable from 9.5 to 11.5 cubic feet. The great expansion ability accommodates odd-shaped items with ease. The interior space is divided into two pockets for a more organized storage. This cargo bag has 6 straps designed to provide a secure attachment. This is a durable cargo bag that comes ready for adventure. It has a double vinyl construction that’s completely weatherproof. Welded seams come in handy to lock out water ensuring your items stay dry. This cargo bag provides 15 cubic feet of storage space, which is roomy enough to fit large, oversized items. 8 built-in straps let the bag attach to the rooftop of your vehicle without a hassle. This bag comes in a folding design to provide versatile storage. CURT 18221 cargo bag gives your vehicle some extra usable space for storage. The bag secures to the rooftop of your vehicle. It’s made of thick 500D vinyl fabric to provide great resistance against UV rays. The seams are perfectly welded to give a cargo bag that’s completely waterproof. The zippered closure system combines with hook and loop closure system to provide easy access and keep your items secure. The zippers have large holes through which you can fit a padlock. Tiedown straps keep the cargo bag secure on the carrier frame of your vehicle. This cargo bag is designed to provide 21 cubic feet of storage. This cargo bag is among the largest out there. It offers 20 cubic feet of storage space enough to fit tons of items. You can fit inside a cargo basket to allow for a more secure storage. The harness system is made up of 6 straps designed to keep everything secure. This bag has a rugged build that can take a beating from weather elements. Concealed zippers keep your items out of sight. The bag has sealed seams that keep out water. It folds away for storage when not in use. This waterproof cargo bag is a quick solution for increasing your vehicle’s storage capacity. The bag opens up to provide 15 cubic feet of storage space. As the name implies, this cargo bag is designed to sit on trays to give a safe and secure attachment. Trays need to be 60 x 18.5 inches or larger to be able to fit this waterproof cargo bag. The bag keeps out road grip to ensure your items stay clean. 6 straps are included for secure attachment to the storage tray. When not in use, the bag folds flat for compact storage. This cargo bag lets you transport safe and secure regardless of outdoor elements. 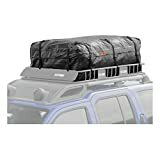 It’s a rooftop cargo bag designed to secure on the crossbars or roof basket. The bag opens up to 15 cubic feet of storage. It’s made of a heavy-duty canvas material that’s gentle on your items yet tough on weather elements. The canvas locks out water and gives a good level of protection against UV rays. Ratchet straps make it easier to attach the bag to the rooftop. Highland 1041700 cargo bag is made of a laminated fabric that gives good resistance against UV rays while remaining waterproof. The smooth finish of this fabric makes it easier to wipe clean for easy maintenance. It’s a rooftop cargo bag designed to fit most hitch-mounted cargo carriers. The bag has up to 13 cubic feet of storage space enough to fit tons of items, even the odd-shaped objects. Straps make it easier to attach to the hitch carrier of your vehicle. 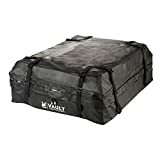 This is a versatile, heavy-duty cargo bag. 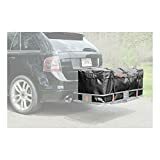 It’s designed to fit hitch carriers, trailers, SUV’s, and more. The bag is made of a premium weatherproof material that keeps out the elements. It wipes clean with ease and is tough enough to resist wear and tear. This bag has 15 cubic feet of storage space, which is a good size for most hitch carriers. Built-in lashing straps give you an easy time harnessing the bag to the carrier frame of your vehicle. This waterproof cargo bag is made of a thick vinyl material that’s waterproof and resistant to UV rays. It’s well protected from dirt, road grit, wind, and other elements. Thick 1-inch straps give a firm attachment to keep your items from being jostled around. The straps are long enough to wrap the bag three-quarters of the way. Heavy-duty zippers provide extra security and have large holes to fit a padlock. This cargo bag folds up to a compact size for easy storage. It has a storage capacity of 15 cubic feet.